We have several types of TV rental options. Depending on your audience size, and the type of environment you’re in we will be able to suggest the right TV for you. TV’s add than wow factor to any presentation or Trade show. The main reason to rent a TV from us, is we will setup and deliver your TV on time and make sure your 100% happy with your rental. We now offer UHD 4K TV’s and monitors sizes 50″-80″ please call for more information. We offer various sizes 42″-60″ some sizes have limited availability so please call. We offer various sizes 20″-65″ larger sized have limited availability so please call. We offer Various sizes 32″- 50″. Available for certain TV’s. 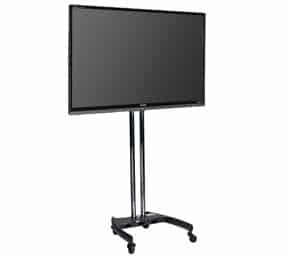 Dual pole stands provide portability to your rental. Some stands are equipped with wheels, making it easy to move from place to place. Our staff is now capable of syncing multiple TV’s together using a new wireless technology. We also have the capabilities to run hardwire to sync up Tv’s and other video sources. So if you looking to broadcast your message to multiple devices at the same time, we have the answer. Call us for more information. Most TV’s have built in audio. However if you are looking for a higher quality audio an external audio system will provide the highs and lows and coverage you are looking for. To learn more please click on our Audio Systems.